Scientists have created sheets of flexible graphene by burning a cheap polymer with a laser. The result is a jumble of interconnected graphene flakes with five-, six-, and seven-atom rings. The five- and seven-atom rings would normally be considered defects, but, in this case, they’re features. The process makes graphene that may be suitable for electronics or energy storage. “This will be good for items people can relate to: clothing and wearable electronics like smartwatches that configure to your smartphone,” says James Tour, a chemistry professor at Rice University. The process works in air at room temperature and eliminates the need for hot furnaces and controlled environments. This approach to making graphene is quite different from previous works by Tour’s lab, which pioneered the small-scale manufacture of the atom-thick material from common carbon sources, even Girl Scout cookies, and learned to split multiwalled nanotubes into useful graphene nanoribbons. But as in the previous work, the base material for what the researchers call laser-induced graphene (LIG) is inexpensive. “You buy polyimide flexible plastic sheets in huge rolls, called Kapton, and the process is done entirely in air with a rapid writing process. That sets it up for a very scalable, industrial process,” Tour explains. Tour says the resulting graphene isn’t as conductive as copper, but it doesn’t need to be. “It’s conductive enough for many applications,” he says. 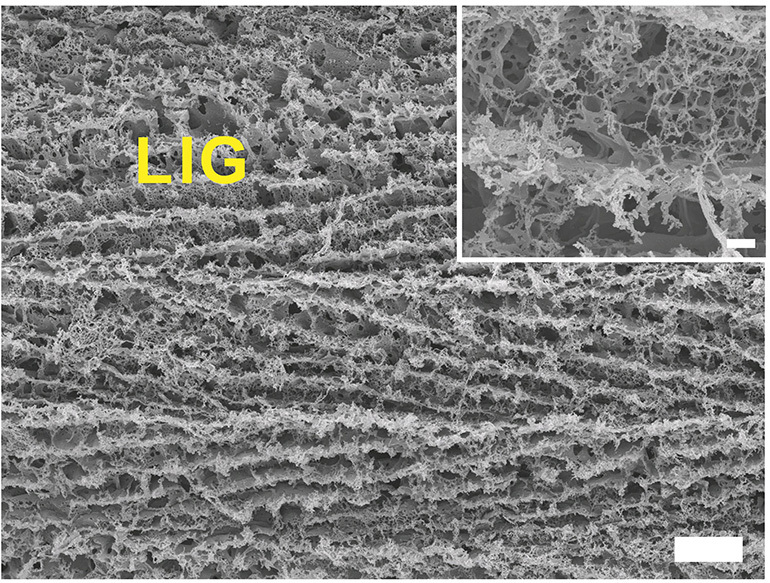 He also says LIG can easily be turned into a supercapacitor, which combines the fast-charging, power-storing capacity of a capacitor with the higher energy-delivering capability, though not yet as high as in a battery. The defects could be the key, Tour adds. Professor Boris Yakobson, a theoretical physicist, is a co-author on the study in Nature Communications. Calculations by his group show that these balancing five-and-seven formations make the material more metallic and enhance its ability to store charges. “Theoretical methods and density functional computations allowed us to look inside the electronic energy states’ organization,” Yakobson says. “What we discovered is that the very low density of available states—which is crucial for the layer capacitance—increases dramatically, due to various topological defects, mainly pentagonal and heptagonal rings. “The fact that highly defective graphene performs so well is a freebie, a gift from nature,” he says. The Air Force Office of Scientific Research, the Office of Naval Research, the National Center for Research Resources, the National Science Foundation, and the National Institutes of Health supported the research.